Operated by the North Bay Regional Centre, the North Bay & District Ambulance Service has paramedic stations located in North Bay (1), West Nipissing (1) & Whitney (1) providing services to a total population of approximately 65,000 people and runs 15,000 calls annually. The Ambulance service is a 24 hour 7 day a week Basic Life Support / Advance Life Support service that provides high quality pre-hospital patient care to the sick and injured. The Ambulance Service staffs 7 ambulances during day time hours and staffs 5 ambulances during the night. 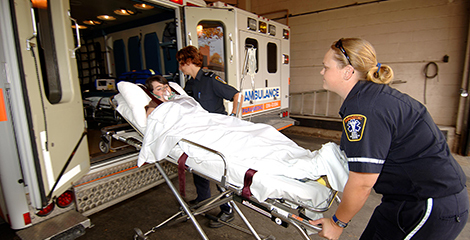 We recognize that the provision of quality patient care is only possible through the strong relationships that exist with other agencies such as the Central Ambulance Communication Centre (North Bay), North Bay Regional Health Centre, Centre for Pre-hospital Care Program, North Bay Fire Department, out lying Fire Departments, the Ontario Provincial Police and the North Bay City Police Service. Finally, the relationship with the District of Nipissing Social Services Board and the other ambulance services within our borders strengthens our commitment to a higher quality of patient care. The North Bay Central Ambulance Communications Centre (CACC), a department of the North Bay Regional Health Centre (NBRHC), provides emergency medical communications services twenty four hours a day, seven days a week for an area of approximately 60,000 square kilometres. Through state of the art computer aided dispatching, radio and telephone equipment, code 4 emergency calls are answered and dispatched in accordance with the 90th percentile in less than two minutes. As well, Ambulance Communications Officers provide pre arrival instructions that include first aid as well as telephone CPR and choking protocols. Annually, 30,000 calls for assistance are received on 911 lines, dedicated `emergency lines as well as administrative and hospital lines. In an Emergency do not hesitate, contact 911 immediately.